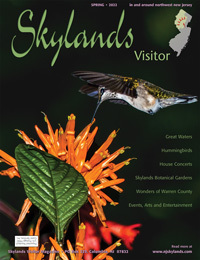 Although it may not match the drama of the Delaware Water Gap or the legend of the Appalachian Trail, Hunterdon County has plenty of diversity to offer hikers wishing to explore the unspoiled areas of the Skylands Region. A number of trails are maintained by the county's park system and offer a good stretch of the legs for hikers who don't have entire weekends of leisure at their disposal. While overnight back packers may desire longer routes, Hunterdon County is the perfect place for day trips and novice hikers trying to get a feel for the sport. The network of trails winds its way through nature preserves and along streams and lakes, offering panoramic views of the county's picturesque mountains and valleys. "I would say it's a good place for beginners," says Pat Hennessy, of the Hunterdon Hiking Club. "There are some nice, smaller trails to take day trips on, and they are very well maintained. Most of the trails are smooth and a lot of our members just wear sneakers instead of hiking boots. Hunterdon County really is a hidden treasure. They call it 'Little Vermont' because there are areas which are just beautiful." Port Murray in Warren County from Point Mountain. One of the most well known venues is the Point Mountain section of the Musconetcong River Reservation. Located at the county's northern tip at Musconetcong River and Point Mountain roads in Lebanon Township, Point Mountain is one of the newer hiking areas and offers one of the more rocky trails in Hunterdon. So, lace up the hiking boots for this one. The four-mile hike starts in open fields and ascends into the woods and uphill toward the Warren County border. From there you travel along the Musconetcong River or take another trail toward the back end of the park. "This is for people who like to climb over rocks," says Shirley Leslie, a 15-year member of the Hunterdon Hiking Club. "When you reach the top, you can look out over the entire county. It's quite a view." The other half of the River Reservation is the Musconetcong Gorge Section on Route 519 and Dennis Road in Holland Township. "That's a very nice walk," Hennessy says. "You go over a nice walking bridge over a little creek, walk down into the gorge then back up again." Spreading over 396 acres, this trek wanders through an 80-year-old forest and takes the hiker past rock wall remnants, grapevines and a variety of trees and ferns. There is also a view of the Warren Glen Paper Mill, which opened for business in 1873. The mill uses wood pulp from as far as Chile, but the water comes straight from the Musconetcong. A rest point at the top of the trail features a breathtaking ravine view of a flowing stream and eastern hemlock evergreens. Another of Hunterdon's more popular trails is the Round Mountain section of Deer Path Park. Located at West Woodschurch Road in Readington Township, the 1.5-mile trail delivers a variety of natural and man-made wonders. The journey begins along a living fence built by rows of orange trees, which were planted by early farmers as hedgerows; windbreaks; and natural cattle fences that were used prior to barbed wire. Up next is a large open space of agriculture, reflecting a simpler time prior to motorized vehicles. The path continues along a streambed with exposed shale bedrock, past a stone wall that once represented boundaries for farmers, and to the base of Round Mountain. A 600-foot mountain formed by volcanic activity, this was once a popular site for logging. The trail then loops back toward its origin, where you pass an old farm road laid out by farmers in order to transfer their equipment from field to field. That leads to the highlight of the hike: a scenic view that affords one the ability to witness the full splendor of the Sourland Mountains and the town of Flemington on a clear day. The Teetertown Ravine Nature Preserve, located at Hollowbrook and Pleasant Grove roads in Lebanon Township, offers 147 acres of one of the most significant unfettered areas in Hunterdon. 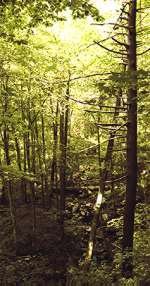 The trails provide the quiet of a densely wooded area that features a variety of hardwoods, shrubs and animal life. The subtle gush of a rushing stream composes a natural melody during the hike. 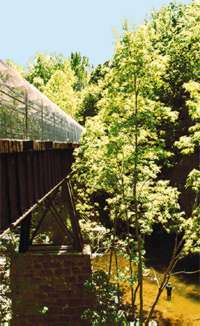 The Ravine has been maintained as much as possible to preserve its natural state. Colored diamonds painted on trees throughout the park marks Teetertown's three main trails. The White trail is comprised of two old logging trails and is used to access other trails. Parts of the trail wind along a stream and old rock walls erected by early farmers. The Red trail begins 300 feet from Hollowbrook Road and weaves its way through much of the upper portion of the preserve. Halfway through you emerge in a field, turn left then re-enter the woods in what promises to be a diverse walk. Be prepared for some steep hilly areas. The Blue trail, which is the upper portion, crosses a stream deep within the preserve and winds inside a small ravine until exiting over a rock wall. That leads you through a swampy area swarming with wildlife, but beware on the next portion, as poison ivy vines are abundant. The trail winds up at the top of the ravine with a spectacular view of the valley. Located just northwest of Flemington at Barton and Altamont Roads in Raritan, the Uplands Reserve provides a 100-acre expanse that combines a mature hardwood forest with fields, hedgerows and thickets. The Reserve can only be accessed through Mine Brook Park and the Morales Nature Preserve, which feature looping trails that either bring you back to your origin or into the Uplands. Park on Capner Street near the junction from Old Croton Road to begin your ascent through Morales into the Uplands. The reserve is a one-mile looped trail marked by red diamonds. "It's a moderately hilly trail and very pretty," Hennessy describes. "The trails are basically dirt, there's a nice stream at the start and there are some benches to sit on. It gives you a nice variety." The Sourlands Mountain Nature Reserve at Rileyville Road in East Amwell offers a two-mile level trail that links with further trails, which could provide a six-mile trek if you decide to loop around the entire reserve. "You can take a long hike or a short one, it's up to you how ambitious you feel that day," Hennessy adds. "It's very pretty, a little more rocky than Uplands, but relatively flat." The Hunterdon County Arboretum is located on Route 31 in Clinton, just north of the Park System headquarters. Six trails encompass two miles of flat terrain that wander through a maze of ornamental trees and shrub plantations. The Outer Loop trail is a 1.1-mile loop through fields, trees, wetlands, and along a stream and pond. There is also a bench at the halfway mark. The shorter Discover Trail connects with the Outer Loop and the Two Line trail, and demonstrates field succession. The Two Line trail takes you through an old nursery, which becomes obvious when noticing the trees planted in perfect rows. There are also exotic species along the trip that do not grow naturally in New Jersey forests. The Memorial and Dogwood trails are also worth checking out, along with the Boardwalk/Wetland Study area. Finally, the Echo Hill Environmental Education area features a hiking path through hardwood forests and around a two-acre pond. Located on Lilac Drive in Clinton, Echo Hill offers diverse scenery that includes abandoned railroad right-of-ways, iron truss and trestle bridges, evergreen bluffs, old farm fields and the largest marsh in Hunterdon County. Also abundant in Hunterdon are old railroad beds that have been transformed into trails. One of the more popular is the Columbia Trail, which runs through Califon, High Bridge, Clinton, Lebanon and Tewksbury. "That's a lot of fun," Leslie said. "They have a very high railroad bridge that goes over a small, narrow road, so if you're afraid of heights, you're in trouble. But it's a great trail that goes into Morris County, and along the way you can stop off and visit the little town of Califon and do some different things there." So if you are looking for a pleasant way to spend the day, complete with exercise and education, check out a hiking trail in Hunterdon County. The trails have a steady flow of visitors, but are rarely crowded, so you can walk at your own leisure and enjoy the fresh air environment. For further information on Hunterdon County trails, call the Park System at (908) 782-1158. For information on the Hunterdon Hiking Club, call Pat Hennessy at (908) 806-7147.